Express yourself! 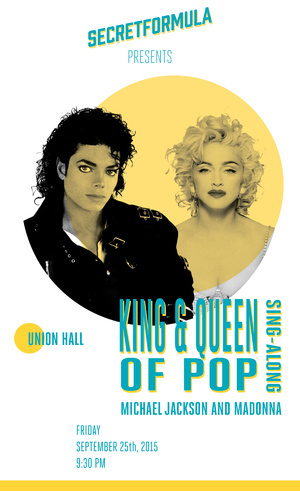 This Friday, September 25th at 9:30 p.m. at Union Hall in Brooklyn, for $10 you can join Secret Formula's sing-along to the original King and Queen of Pop - Michael Jackson and Madonna. In lieu of a microphone and a long list of people ahead of you, Union Hall ditches the Karaoke staples for beloved music videos with lyrics on big screens for the whole crowd to enjoy. Other festivities include a Michael Jackson and Madonna costume contest, a Michael Jackson dance-off and Madonna Vogue-off competitions, themed drinks such as the Dirty Diana and Eva Peron, prizes and memorabilia to be had!